Jaguar Specialties is proud to announce that we now can offer replacement, repair, and service parts for your Jaguar car. Our supplier is the same one who provides parts to professional auto repair shops, so these are all top-quality items. Remember, professional shops can only afford to make a repair once, so it has to be right the first time. Because of that, they use only the best quality parts. Now you, the Jaguar end user, have access to these same parts, but at a substantial savings. 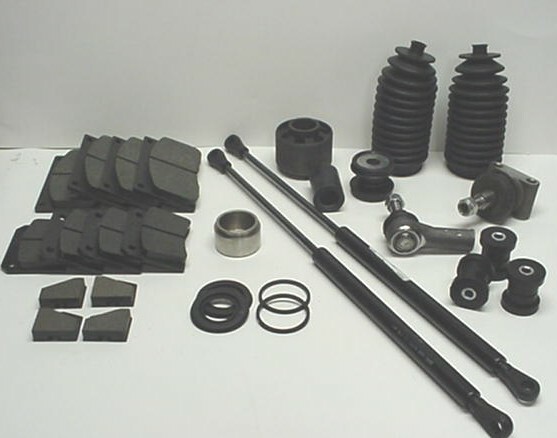 Suspension- ball joints, all bushings, wheel bearing sets, sway bar components, subframe mounts, shock absorbers, springs, rebuilt power steering racks, XJ40 rear suspension conversion, etc.,. Brakes- Semi-metallic pads, rotors, caliper seal kits, caliper pistons, rebuilt calipers, master cylinders, hoses, ABS accumulator, etc.,. Fuel- pumps, filters, fuel solenoids, etc.,. For current pricing, please see the price list page (We think you’ll find the prices outstanding). Note: This is only a partial listing of what is available- we can provide nearly any part you might need, so if what you want isn't listed, just Email us for a quote. We can probably get it, and usually at a good discount over other retailers. Prices do not include shipping- we usually ship Fedex Ground or USPS, both of which are very cost effective and secure. It is much more economical to ship several items at a time, so combine your purchases. All the items listed on the price list are normally in stock and can be shipped right away; occasionally, stock of some popular items does run out and a back order situation may occur. Please check with us at time of order for availability, and we can advise accordingly. A backorder lead time of up to 4 weeks is not considered unusual. Backordered items usually come in much sooner than that.